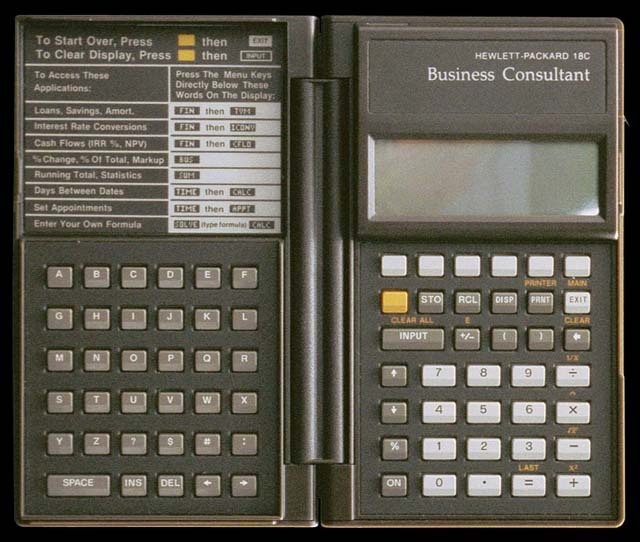 The HP-18C is a business calculator. It has a pocketbook design with an alphabet keyboard. The 18C was HP's first algebraic pocket calculator. In addition to financial functions, it includes a clock with appointments, and a powerful equation solver. It has four numbered registers and named lists. The LAST key retrieves the value on the next level of the stack into the current expression. An advanced business model, the HP-18C calculator had a "clamshell" design, opening like a book with two keyboards facing each other inside. It included graphing and a date-time-alarm feature similar to a personal organizer. The 18C had 2K of memory. The 18C was originally priced at $175 in 1986, with street prices around $140. It was released after the 12C, likely intended to replace the 12C, but did not.